Ordinary number signatures Serm-Chot VF about 53,000 - 56,000 baht. Ordinary number signatures Chot-Chot EF about 17,000 - 18,000 baht. Ordinary number signatures Chot-Chot VF about 5,500 - 5,800 baht. Ordinary number signatures Serm-Puay UNC about 1,400 - 1,500 baht. Ordinary number signatures Serm-Puay EF about 420 - 440 baht. Ordinary number signatures Soontorn-Puay UNC about 1,300 - 1,400 baht. Solid number xxxxxxx signatures Soontorn-Puay VF about 18,000 - 19,000 baht. Solid number without signatures print "SPECIMEN" UNC about 36,000 baht. 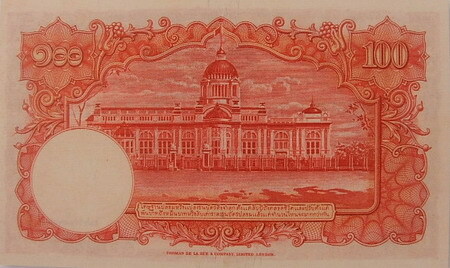 The 9th series 100 baht type 3 banknote is identical to the 100 baht type 2 banknote. But the note has a security thread instead of color silk fibers as it was in the 1st - 2nd series. Even though each type of 100 baht 9th series banknote is quite similar, the different points of the 100 baht type 3 banknote are the portrait of King Rama 9 in older of age and the serial number that is printed in black color as well as a security thread. And the watermake image is the constitution placed on pedestal tray. 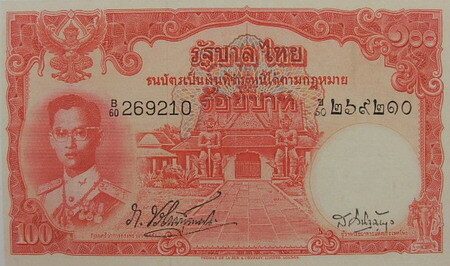 The 100 baht type 3 banknotes were announced on 25th November 1955. The main object is the image of King Rama 9 in older age in the uniform of the supreme. The middle image is the crown-top gate at temple of dawn. The serial number is printed in black color. There is a security thread. And the watermake image is the constitution placed on pedestal tray.